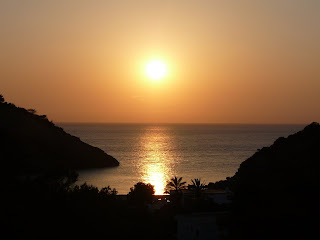 The Journey Home - Our Last Blogg! Well, this is our final blog and it has taken us a while to get around to it. We have been pretty busy since we got home but really wanted to finish off our adventure with a blog from the journey home... We flew direct to London on the way over so thought we would take our time on the way home to avoid some jetlag, relax and enjoy some sun while we had the opportunity. First stop was Hong Kong. We had a good flight with Cathay Pacific and were lucky enough to have some of Sam's family to visit which kept us up on the first night. 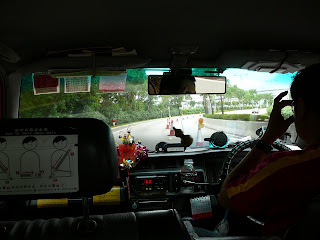 After we got the very decorative taxi (above) to our hotel we went and met Sam's uncle Tony and cousin Elissa for a lovely traditional Cantonese meal. It was the first time I had ever had a cup of tea to drink with the actual main meal, different...but yum! 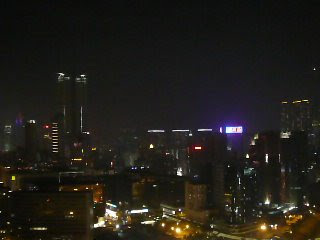 We then got our first look at the HK skyline from the top of Elissa's apartment block. It was amazing. We dropped Tony off then Elissa kindly took us to one of the street markets. It was sensory overload! With bright lights, so many people, smells, traffic, bright tacky toys, clothes and accessories. It was just crazy and great to see. Day one we walked along the harbour edge and caught the famous Star Ferry from Kowloon to central. 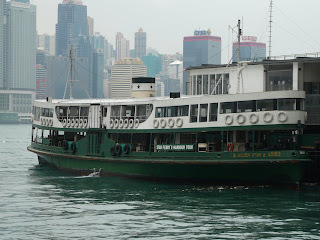 The Star Ferry (below) is very old, rocky and full of character. 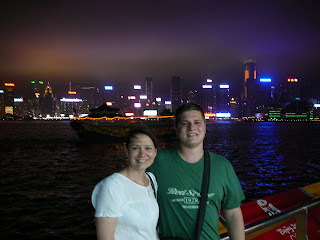 It was a great, quick way to get across the harbour from mainland Kowloon to Hong Kong Island. 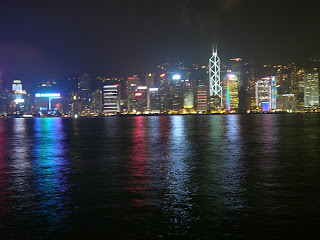 There are lots of things to do on Hong Kong Island. 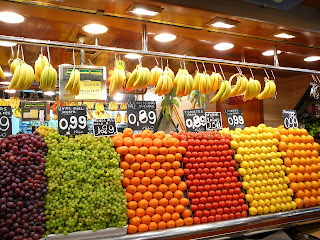 It took us a while to firstly navigate our way through all the shopping/business buildings which are all mostly linked by air conditioned walkways to avoid the heat and humidity. We got briefly distracted by some of the many designer stores on the way to the Peak Tram. 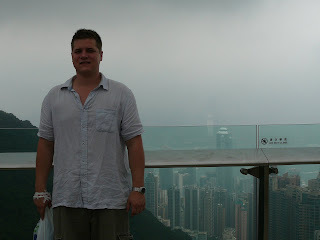 The Peak is HK Island's highest point. The view from the summit is supposed to be one of the most spectacular cityscapes in the world. 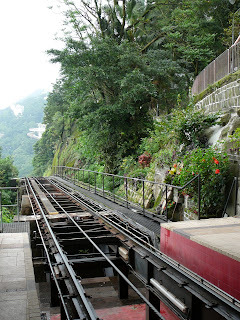 The tram ride to the top of Victoria Peak was really fun, it is soooo steep, nearly vertical - we were laughing on the ride up cause it felt so weird. You can see here how it just drops over the edge! 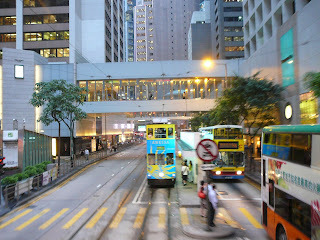 We also had a ride on the tall, narrow trams that get around the streets of Central on HK island. 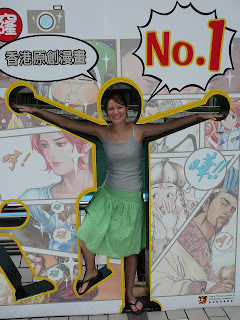 While on HK island we went on a really nice bus ride to the Stanley Street market which sold a range of cheap clothing and junk. We didn't buy much from the many shopping opportunities in HK (even the very long Nathan Road in Kowloon) mainly because our suitcases were already bursting with stuff we were taking home from London! We spent a really nice evening exploring the many shops, restaurants and markets on either side of the 'pedestrian (mid-levels) escalator'. It's a great way of moving people up a very steep area of town called SoHo. 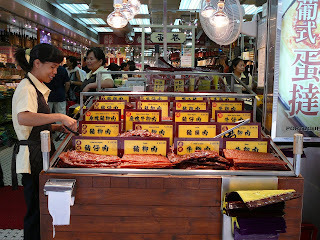 This is where we found a 'wet market' (pic below). It's called this because the ground is continually hosed down to wash away all the spills from the fish, fruit and vege stalls. 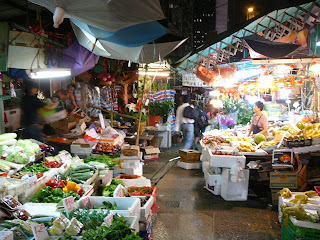 It's a very colourful and smelly place! Back on the Kowloon side we took in more of the amazing skyline, oh and I got a wonderful foot massage from one of the many reflexology/massage shops. 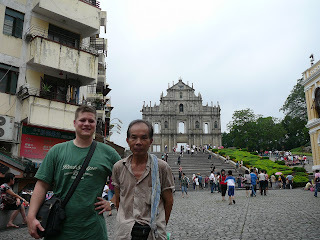 While we were in HK we took the opportunity to visit Macau. It took an hour to get there by ferry. 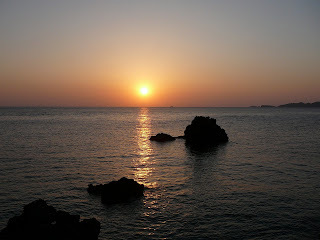 It is a tiny territory which used to belong to the Portuguese but is attached to mainland China. 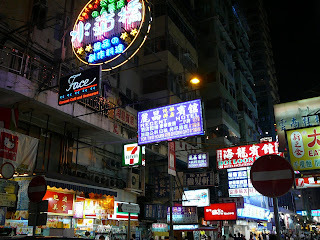 Macau has many casinos and this is what has now made it a popular tourist spot. It rivals Las Vegas which is very weird and now has many of the same big casinos like Wynn and MGM Grand. 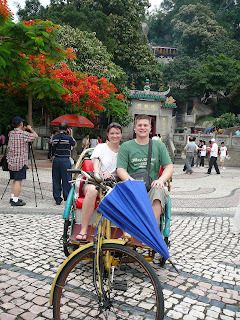 A popular way to get around Macau for the day is by bike like the one below. You pay a driver to show you the sights on his bike. We felt quite uncomfortable with this especially as our driver was a very small little Chinese man who we thought would struggle with Sam and I!!! 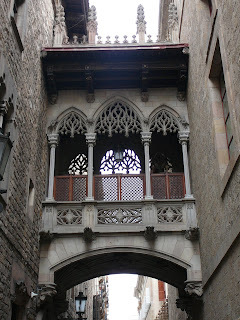 But he was keen to take us and show us the sights of his town. He was lovely and of course we bought him drinks as it was so bloody hot and gave a generous tip out of guilt! Anyway, he took us to some great places. 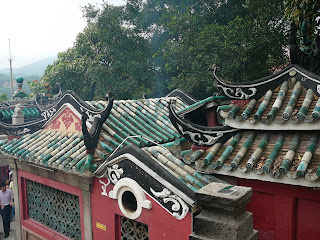 First stop was A-Ma Temple. It's behind us in the pic below. 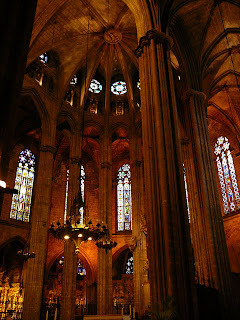 It was a really beautiful place, unlike anything we had seen before. 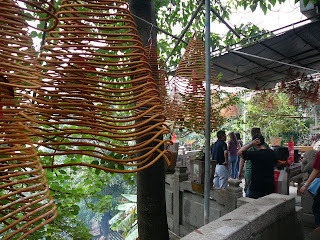 Everyone had incense burning, which is what the coils above are made from. 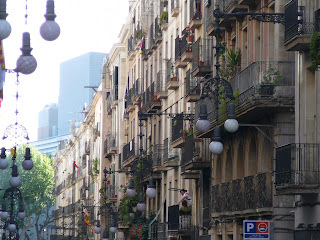 Then we got back on the bike and drove through some very interesting streets full of shops and markets. Our tour ended at the ruins of the church of St Paul (below) - apparently the greatest monument to Christianity in Asia, and the guy is our driver. He was much happier than he looks in the picture! Cute, funny man! 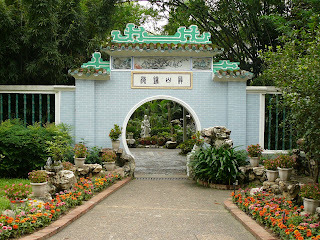 After our guide left us we walked in the stinkin' heat to the Lou Lim Ioc Garden. Tricky to find but is was a lovely spot with huge shade trees, lotus ponds, bamboo and a bridge with nine turns to escape the evil spirits (who can apparently only move in straight lines). 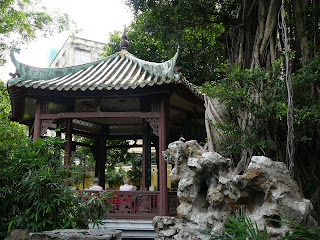 Local people were using the garden to play cards or and practice t'ai chi. 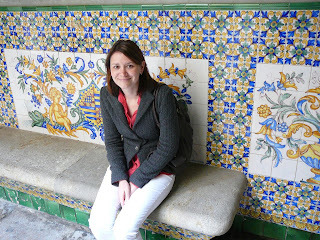 This is me, below in one of the town squares which we thought looked very European, from the Portuguese rule. 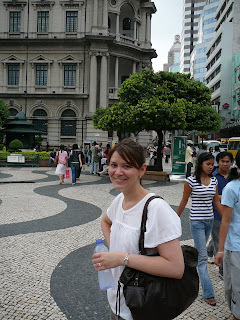 Macau was a great day trip spot. We spent the first day hanging at the beach which was the main reason for visiting Thailand. Did I mention how warm the water was?! - Amazing! Below is the beach just in front of our hotel where we were constantly harassed by the local people selling their creations. Some stuff was pretty cool, and useful, like a sand brush to clean the beach chairs. Great Idea! We spent a fair bit of time here, in and out of the water and sipping cocktails. We decided to venture from Kata Beach into Patong to check out the notorious night life. We tried our bargaining skills with the tuk-tuk guys but got better at it as the trip went on. Anyway, this is me catching a ride in the back of an over priced tuk-tuk on the way to Patong Beach. We found a really cheap, really yummy Thai restaurant and grabbed some dinner. Then we wandered along to the main drag, found ourselves a good seat out the front of a bar and watched the crazy crowd pass by. We were warned about 'lady boys' but still couldn't figure out why there were so many??? 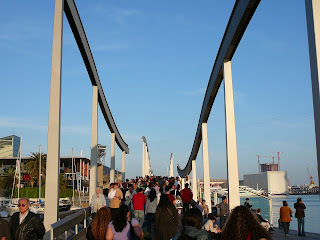 Anyway, there were all sorts of people there having a good time and a good laugh! We were certainly glad that we weren't staying at Patong though. Kata Beach where we were was a bit quieter and generally nicer in every way. It was good to be able to escape the weirdness! The streets were lined with tuk-tuks and people trying to sell things. They were quite forceful but it's all good fun. Sam found a new friend, someone was selling photos of this monkey and we couldn't resist a cuddle even though it doesn't seem right at all. The poor monkey just looked like he wanted to go home to bed, we hope he is well looked after. Closer to Kata Beach was a bar/restaurant with this young elephant out the front on most nights. She was very cute and very friendly. People were paying the owner to feed her bananas which she couldn't get enough of. The kids walking by thought it was wonderful. I guess we did lots of animal related activities in Thailand but it was all great fun and unique to Thailand. Another interesting one was a cobra show. They are just amazing the way they hypnotise them, very entertaining! We've also got a photo of me holding the snake and it's a shocker! I was freaking out as it wrapped it's tail up under my dress and between my legs!! So it didn't make the blog! We took a 3hr boat ride to get to Phi Phi from Phuket. The photo below is the area where the boat came in. 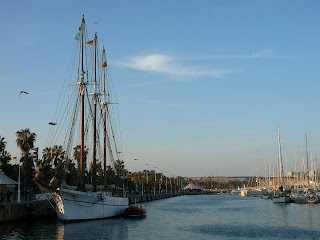 We were in a big ferry but there are lots of long boats there too which the locals use to shuttle people around. Most people go to Phi Phi for a day trip or do day trips once they are there. The beach on Phi Phi wasn't as nice at Kata but the little coves close by are just stunning. Our first night on Phi Phi there was just the most beautiful sunset - EVER. The clouds were the most amazing orange colour. We were very lucky to see it. We were lucky with the weather in general in Thailand considering we were there in wet season. We just had a couple of rainy days at the end of the 9 nights so not bad at all. 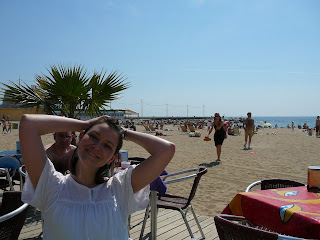 It was very hot though, but we were sick of the cold. We did a day trip the next day on a speed boat with 6 other people. 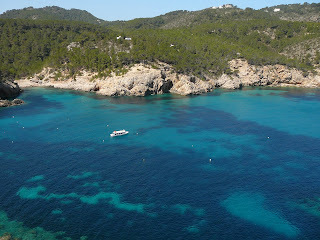 We went to some really gorgeous spots with crystal clear, aqua couloured water and sheer jungle cliffs. It was cool. 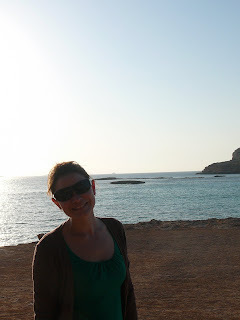 We went to some great snorkelling sites (like shark point!) as well and a spot for cliff jumping which a couple of people finally did. We were deterred after our native guide said he had never done it and he was pretty adventurous! He also warned to jump straight or you risk breaking ribs!! that was enough for us. The night life of Phi Phi is so relaxed. 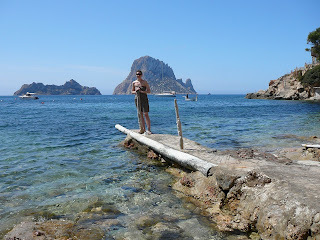 It's a very natural island lifestyle so not many luxuries but still cool bars with good atmospheres. There are little shacks with people selling food straight from BBQ plates and often funny smells from the heat and poor living conditions. We noticed no one gets dressed up and there are lots of kittens and cats with stumpy tails (apparently from inbreeding?). The place is just very cruisy. We went to a bar one night to see some Thai boxing. Sam enjoyed it but I left early because i didn't like seeing drunk tourists encouraged to fight each other with little control over the situation even though they were in the ring. Sam said the professional thai boxers came on soon after I left and were more controlled and talented. Oh well, not my thing but very popular with lots of people. 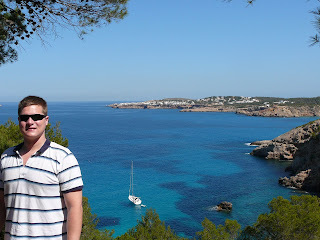 On our last full day we wanted to revisit one of the spots we were taken to on our day trip. It was called monkey beach and we didn't have much time there on the tour. We paid a guy to take us there on our own in his long boat. We had bought a bunch oof bananas for the monkeys from a stall on the island. We were the only ones there when we arrived and the monkeys quickly came down from the trees for us to feed them. The monkeys are wild but used to being fed. They were surprisingly very calm and gentle. They took the bananas from our hands and peeled them. It was great fun. There were quite a few babies too and there were really cute. This is another monkey on Phi Phi Island, obviously not wild anymore with it's nappy on! It was like the one at Patong and the lady was charging people for photos. Not good really. Well, we had a really gret trip home and are glad we took the time to do it slowly. We also stopped off in Sydney and had 3 nights catching up with Granny and everyone which was great. It was so good arriving in Brissy. Sam and I had been feeling pretty homesick towards the end in London so it was great to see everyone and get home. We had a nice get together at Cathy and Dave's the night we arrived which was great. Now that we have had time to catch up with friends and family properly it feels like we never really left, except that we have a whole bunch of wonderful memories and experiences to look back on together. This is a snap below of our exciting maget collection which we have from everywhere we visited for the whole time we were away. 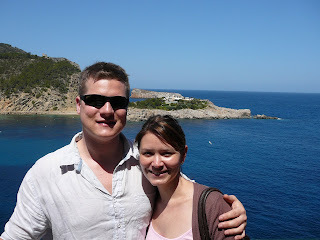 It's fun looking at them and thinking about all the cool things we did in each place. We're a bit sad that this was our last trip but certainly excited to be heading home soon! 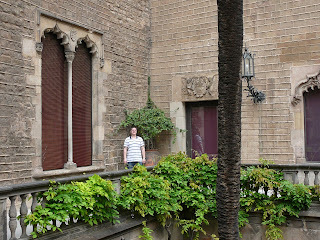 Barcelona is a really cool city which we both enjoyed very much. 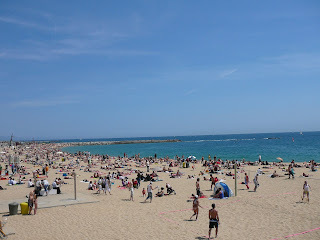 It had nice long beaches and a cool old Town. 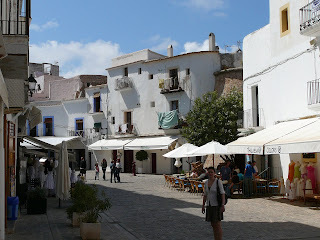 The first few photos are of the old town. 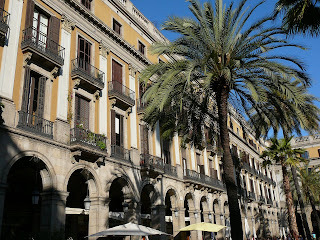 This is Placa Reial, just a cool square in a part of the old town that has loads of restaurants and bars. 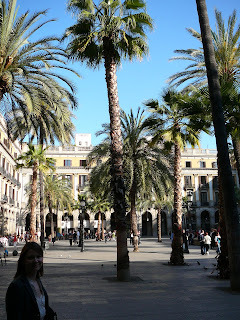 I think its a pretty famous postcard shot of Barcelona. We had dinner here one night because we discovered that the best restaurants have 100m lines in front of them and a restaurant in this square had a great menu cheap! It was a really good meal although I had a starter that turned out be raw slices of beef, I ate half of it hoping it had been at least smoked but no, it was red raw! 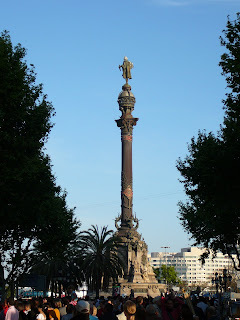 This is Columbus tower at the end of La Rambla. 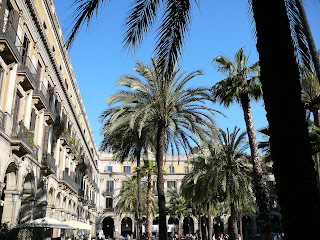 La Rambla is full of street performers and has markets all the way along from the city centre to the port. Some of the things they were selling was pretty crazy. Anyone want a pet Hedgehog..., Iguana? What about some blue roses then? This is the start of the Port. 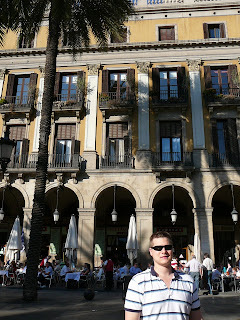 This is where we had dinner on our first night and ate some overpriced Tapas! The Spaniards have a bit of different lifestyle and don't seem to eat dinner until like ten o'clock. Restaurants don't even open till 8:30 - 9ish! 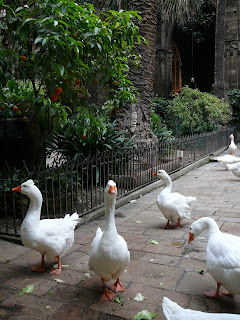 They like to have their siestas and we discovered that we did as well! I could get used to that lifestyle! The sangria is pretty good too! 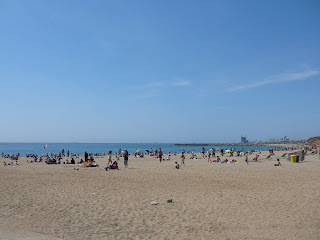 We headed off to the beach the day after we arrived and had a nice walk all the way into town. 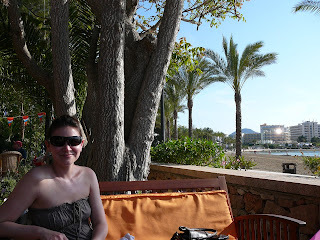 We stopped for a couple of drinks and nibbles at a couple of beach hut style restaurants along the way. 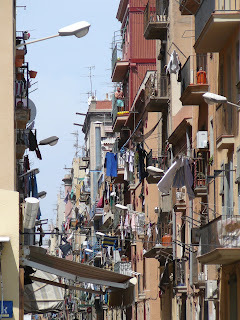 This is just some photo of what some of the streets look like. 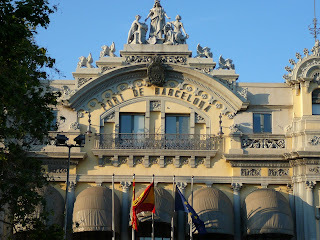 Surprisingly to us though the whole city seemed to be spot less, probably the cleanest city I've ever seen! 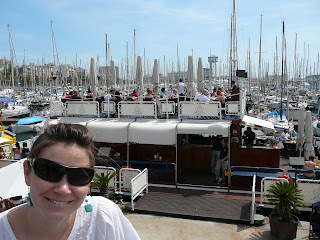 This is back along the Port heading back towards town, we had a couple of drinks on this boat behind Anita, it's a cool idea for a restaurant. 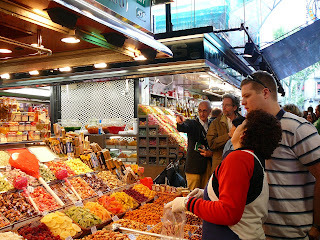 This is back at the market area near La Rambla, just on a side street is a bit of an under covered fruit and deli market. I bought some dried strawberries. 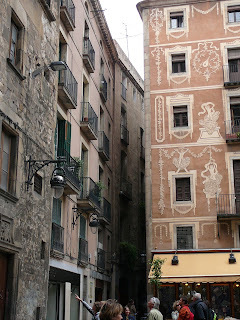 These photos are back in the old town and in and around the Cathedral. runs only 6 months a year and we arrived just before the party season started. It would have been cool to experience the party atmosphere of the island but I think we had a better time having it to ourselves! That's what it felt like at least. 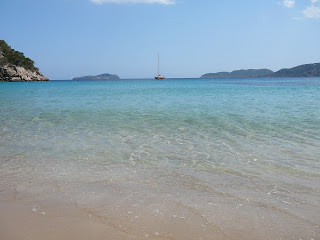 The beaches were nearly empty only a dozen or so locals not many tourists, it was great. We hired a car and just drove around the whole place. Everything was really cheap too because it was out of season. Still warm and sunny though! We hired the car the first afternoon we arrived. The days last bloody long, I don't think it got dark until 9! 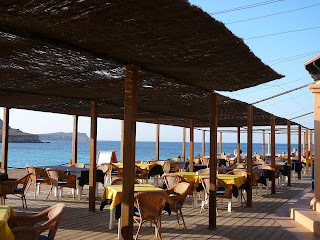 We would find nice spots with cool restaurants and bars about like this one. Really good view! 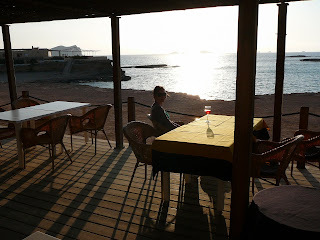 Anita with her glass of wine just before sunset. After, we headed off to another spot to catch the sunset, nice! 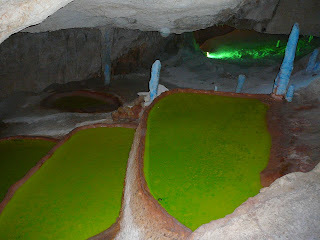 This is some caves that we had a little tour of they were quite interesting! 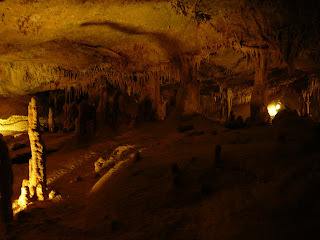 The view from just outside the caves. 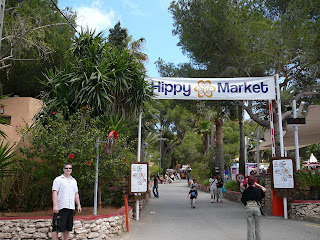 We went to a hippy market which runs every Tuesday. People were mainly selling clothes and accessories. This is the car we hired. 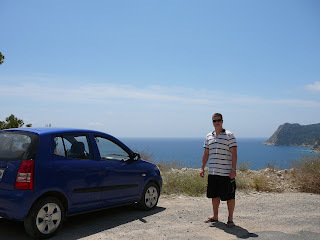 Driving around the island was great fun. Really windy roads on edge of cliffs made an interesting drive and there was lots of places to pull over and take in the scenery. 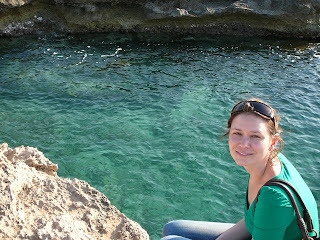 Some of the crystal clear water of the Mediterranean ocean. Another point we pulled over at. 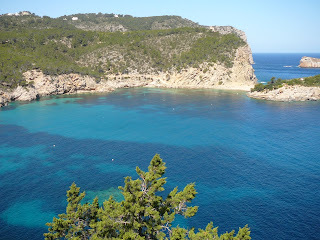 A really great little beach had a spot where the fishing boats dock with little sheds built onto the side of the cliff. Anita's standing on the edge of the makeshift dock. 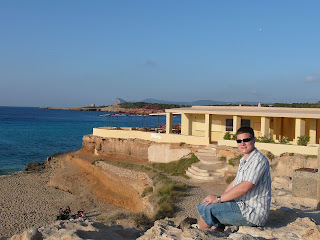 We drove into Ibiza town on our last afternoon of having the car. 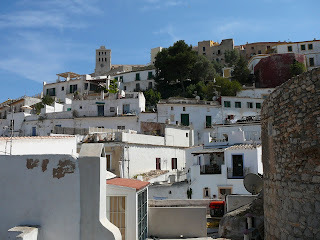 At first we didn't think much of it then we explored a little more and found that it was a great little town! Well this is us at a little cocktail bar at San Antoni near where we were staying. We had just dropped the car back and were enjoying the last sunny afternoon that we'd be having in Europe for some time!